Today’s Pedal Line Friday submission is from Martin Yam Møller . If you have a pedal line (doesn’t have to be in a board) for your rig, please email me a photo, bio, description of pedals and routing to pedalline@nulleffectsbay.com. Every Friday I’ll showcase a pedal line submission. Make sure you include any links to your band or music page. Hi, my name is Martin Yam Møller (from Hong Kong, living in Denmark) and I have a serious Moog addiction. I started collecting Moogerfoogers almost 7 years ago. Just a simple 12-stage phaser MF103, for its swirly wetness. And then the MF104z Analog Delay… one of the sweetest sounding and most flexible bucket-brigade delays ever made. Especially since most of the front panel knobs have expression pedal input control, it is great for creating psychedelicious feedback, while playing the guitar. To be honest, I got the the Freqbox MF107, because I read in an interview that Page Hamilton from Helmet used it for his solos on Aftertaste, and it also sounds like no other fuzz pedal. The MidiMurf 105m is really useful for creating stereo movement from mono sound sources. I got the ClusterFlux because…. well, it’s called, a moogerfooging Cluster Flux! Greatest pedal name ever. Things quickly escalated, when I found the Moog Voyager RME for a good price on the 2nd hand market in Copenhagen. I was always a sucker for a juicy synth bass and Moog have the lowdown know how. All their pedals work with bass guitar too, even dynamic microphones. All power comes from the superbly stable Cioks DC10. Except for the Eventide Space, which is the sole non-Moog pedal. But it has some great presets. Since every Moogerfooger pedal has a lot of control voltage I/O, each pedal gets massively more flexible with the CP251, VX351 and VX352 expanders. Recently I’ve kinda stopped playing guitar through my Moog setup (got another board). When I added the Akai MPC1000 sampler/drum machine, it was all over. 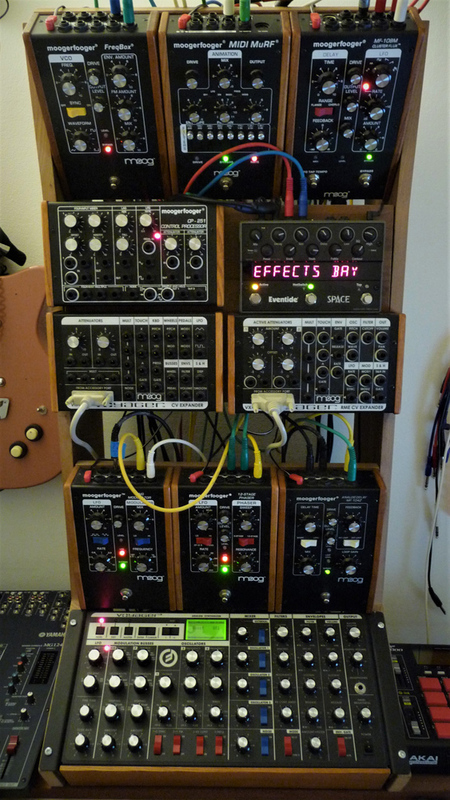 Now I use this Moog rack to make a lot of electronic instrumental music – lofi hiphop/ambient dub/sonic experiments. Sometimes, I sneak in a *synth blues* cover song with some singing. It is all under the name NomNomChomsky.